I am someone who is lazy when it is coming to cook only for myself. Most of the time when I am alone, I go for ready to eat foods like breads and 2 minutes Maggi noodles. Yesterday it was the case where I didn't have breads though. I am bored with Maggi too. Hmm. I have to cook to rescue myself. 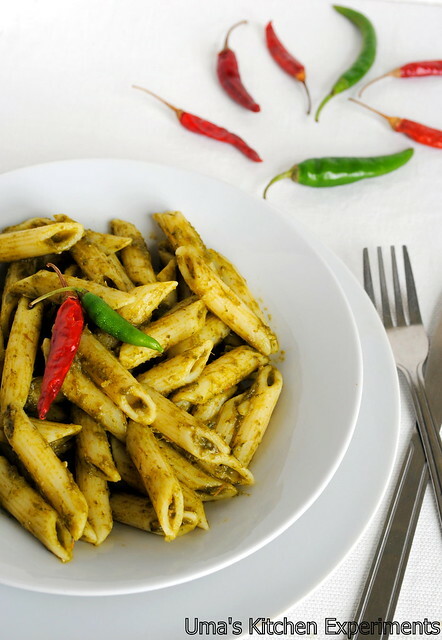 After a quick look into the kitchen cupboard and refrigerator, I have decided to cook this easy spinach pasta and yes, absolutely with Indian relish. 1) Boil/Cook pasta by adding water, salt and olive oil. Once cooked, wash in cold water for 2 times and keep it aside. Cooked pasta should be firm and should not break. 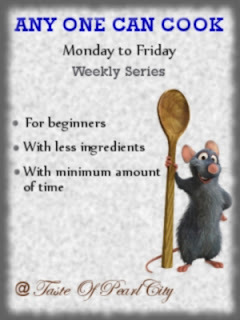 2) Microwave the ingredients given for spinach for 3 minutes. Cool and grind once it is done. You can also choose your desired way to do this. Remember, you already added salt to pasta and make sure to add correct quantity to spinach. 3) Take a wok and heat a teaspoon of oil. Pour the ground spinach and stir till it cooked. 4) Add pasta and mix gently to make spinach to coat the pasta. Cook for 2 minutes. 5) Spinach Pasta is ready to serve. 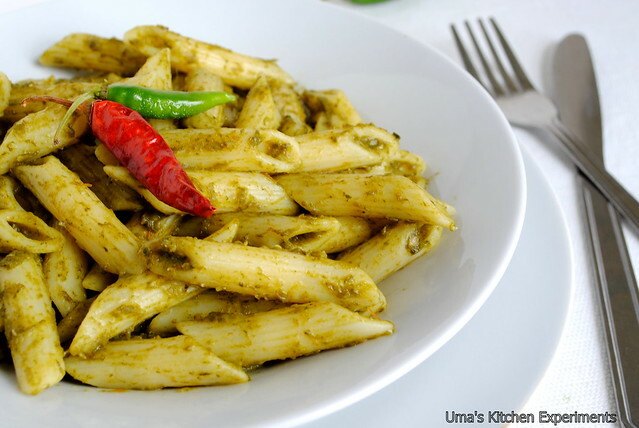 I am linking this recipe to Ramya's Fusion Food - Pasta Event and Any One Can Cook - Series 29. This looks fantastic Uma, simple and delicious. Uma could you please add the Google followers widget so that it is easy to follow you. that looks so creamy and tempting...very healthy pasta... love it,....my kid would definetely love the color..
simple,healthy and tasty recipe. Nice clicks Uma. Pasta with spinach.. Different and healthy.. Lovely clicks.. Awesome looking spinach pasta. Wonderfully prepared. Can you please update the link of the event too..
p.s : I just posted many posts on one day simply, that day I was in good mood to post. thnQ for your kind words dear....they were small but today's post took me 3hrs to write!!! have a look!!! lovely pasta... delicious, colourful and healthy !! I rely on pasta when I am not in a mood to do anything elaborate. Added bonus .. kids love it too. Yummy and healthy with spinach Uma. Simple, quick, delicious & healthy!!! This is a great pasta dish, I love it. 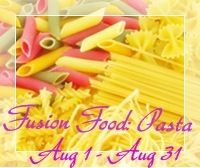 Please have a look at Fusion Food: Pasta event roundup and accept Proud Participant Award as a token of appreciation. Also your pasta has won Picture Perfect Pasta Award..
You know, I always imagined pasta either red or white. But now I have another color! :) Looks fab!